We’re delighted to say that due to popular demand a new date has been added for Auntie & Me at The Greater Manchester Fringe. The show will now run Thursday 26th til Saturday 27th July, giving you an extra opportunity to catch this deliciously dark comedy about dying! Shortlisted for Best Revival at the 2017 Greater Manchester Fringe, directed by CSzUK founder and manager Brainne Edge and starring ComedySportz’s Sean Mason, this mordant and whip smart tragi-comedy returns for another short run. You can find out more about the Greater Manchester Fringe here. You can find all the latest info on our upcoming shows here. It’s time for the Greater Manchester Fringe and whilst our main shows may be improvised, sometimes our players quite like learning scripts and producing plays. In these troubled times of Brexit, Trump, Russia, and all of Manchester’s hills being on fire, what you need is something to cheer you up – so don’t miss this deliciously dark comedy about dying…! Short-listed for Best Revival at the 2017 Fringe, Auntie & Me returns for 3 nights only by popular demand. This production of Canadian writer Morris Panych’s mordant black comedy sees Sean Mason (ComedySportz, New Dawn Fades) return as Kemp, the put upon nephew waiting for his Aunt to die. “I can’t wait to step back into Kemp’s shoes, as sad as they are. He is this sort of Hancock-esque lost figure and the script is so full of rich layers waiting to unravel,” says Sean. “A play about loneliness and death might not sound hilarious, but there is real, heart-felt humour in the script, even at its most absurd or farcical moments,” says director Brainne Edge, whose previous credits, outside of running ComedySportz Manchester, include the acclaimed JB Shorts and stage adaptations of classic sitcoms Whatever Happened To The Likely Lads and The Good Life. Auntie & Me is a whip-smart comedy drama that promises rich humour and emotion with delightfully dark twists and turns that is not to be missed! You can find more information about this production and many other great shows at the Greater Manchester Fringe website. Catch Auntie & Me at The King’s Arms Theatre 23rd, 26th and 27th July. Show starts 7pm. Tickets cost £8 (fees apply is booking online). Tickets are available here. 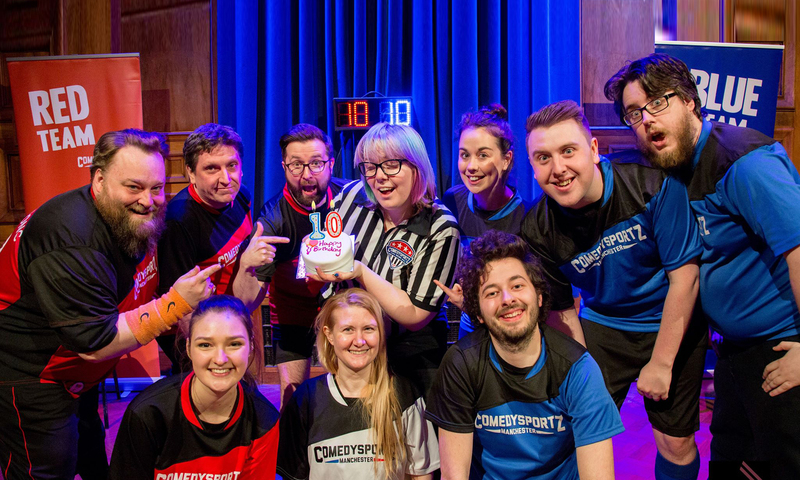 As always you can find out more about all of our upcoming shows including ComedySportz @ The Edinburgh Fringe Festival by visiting our shows page.